Starring the acclaimed international stage and pop singer Nick Jonas (The Jonas Brothers, Les Miserables) and three-time Emmy Award® winner Beau Bridges (Where's Daddy?, The Fabulous Baker Boys) this Pulitzer and Tony Award®-winning "Best Musical" is the hilarious fable of executive dreams and office romance. With a magnificent score that moves to the rhythm of the city by Academy Award® and Tony Award® winner Frank Loesser (Guys and Dolls), this 50th Anniversary revival brings one of Broadway's funniest and best-loved musical comedies back to the stage in a spectacular new production from Tony® and Emmy® award-winning director and choreographer Rob Ashford (Promises, Promises). With the aid of a trusty self-help book 'How to Succeed in Business Without Really Trying', wily window washer J. Pierrepont Finch (Nick Jonas) enjoys a riotous rise up the corporate ladder. Can he get the promotion, the corner office and the girl? Or will he learn that balancing business and pleasure can be precarious - but hilarious - and oh, so much fun? Nick Jonas attends the Once Opening Night! 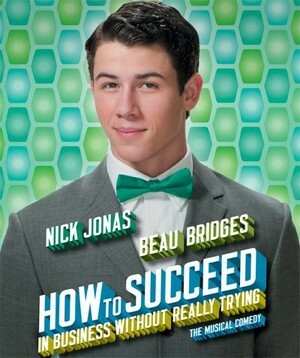 How to Succeed Heartthrob Nick Jonas Is Taking Your Questions! What's Up, Christopher J. Hanke? How to Succeed's Michael Park wins his second Daytime Emmy! John Larroquette wins a Tony Award for his performance in How to Succeed in Business! How To Succeed receives 8 Tony Nominations! How to Succeed in Business Reviews! Broadway Beat Goes Inside How to Succeed's Opening Night! Footage from How to Succeed in Business!